MIXTUR 2003, STOP and START. Kettenberg 15, 51515 Kürten, Germany, and may be ordered directly. U. E. = Universal Edition. 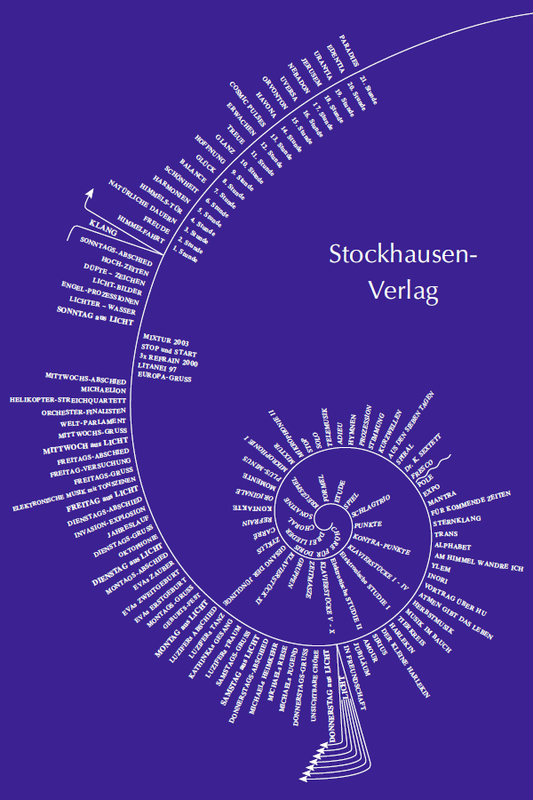 St. = Stockhausen-Verlag. for a cappella choir (cond.) [9'21"] U. E.
(fl. / 2 cl. / bsn. / tp. / trb. / 2 perc. / piano / elec. harpsichord / strings) [19'26"] U. E.
1950 CHORAL (CHORALE) for choir a cappella (cond.) [4'05"] U. E.
1951 SONATINE (SONATINA) for violin and piano [10'32"] U. E.
for oboe, bass clar i net, piano, 3 percussionists (cond.) / sound proj. [11'29"] U. E.
vibr. / ce lesta / piano / harp) [12'57"] U. E.
1952 SPIEL (PLAY) for orchestra (cond.) [16'01"] U. E.
for piano and 2 x 3 timpani / sound proj. [15'15"] U. E.
(with corrections until 1993) [ca. 27'] U. E.
(fl. / cl. / bass cl. / bsn. / tp. / trb. / piano / harp / vl. / vc.) [14'13"] U. E.
1952 KLAVIERSTÜCKE I–IV (PIANO PIECES I–IV) [ca. 8'] U. E.
(fl. / ob. / Engl. hn. / cl. / bsn.) [14'47"] U. E.
1955 to 57 GRUPPEN ( GROUPS) for 3 orchestras (3 cond.) [24'25"] U. E.
1956 KLAVIERSTÜCK XI (PIANO PIECE XI) [ca. 14'] U. E.
1959 ZYKLUS (CYCLE) for a percussionist [11'46"] U. E.
1959 to 60 CARRÉ for 4 orchestras and 4 choirs (4 cond.) [ca. 36'] U. E.
(piano / vibr. / celesta or synth. / sound proj.) [11'54"] U. E.
Musical Theatre with KONTAKTE / sound proj. [ca. 90'] text book U. E.
1963 PLUS-MINUS 2 x 7 pages for realisation [indeterminate duration] U. E.
with tam-tam, 2 microphones, 2 filters with potentiometers (6 players) [ca. 28'] U. E.
4 sine-wave generators and 4 ring modulators (cond.) / sound proj. [ca. 27'] U. E.
4 generator players /4 sound mixers / sound proj.) [27'] U. E.
4 ring modulators, tape, (cond., timer) / sound proj. [ca. 15'] U. E.
1965 STOP for orchestra (cond.) / sound proj. [ca. 20'] U. E.
1969 STOP "Paris Version" (19 players, cond. / sound proj. [20'36"] U. E.
Electronic Music / sound proj. [17'30"] score U. E.
1966 ADIEU for woodwind quintet (cond.) [16'13"] U. E.
piano, microphonist, filterer and level controller (6 players) [ca. 37'] U. E.
1968 STIMMUNG (TUNING) for 6 vocalists / sound proj. [ca. 70'] U. E.
1968 STIMMUNG (TUNING) "Paris Version" / sound proj. [ca. 70'] U. E.
1968 KURZWELLEN (SHORT-WAVES) for 6 players / sound proj. [ca. 55'] U. E.
bass clarinet, viola, piano [2'32"] U. E.
1969 FRESCO for 4 orchestra groups (4 cond.) [ca. 5 hours] U. E.
1954 STUDIE II / STUDY II (Electronic Music) / sound proj. to 69 ...denn die Liebe ist stärker als der Tod. to 69 Oh daß du mir gleich einem Bruder wärest..
4 sound mixers with 4 ring modulators (cond.) / sound proj. to 67 HYMNEN (ANTHEMS) Electronic and Concrete Music / sound proj. Electronic Music with orchestra (cond.) / sound proj. with 2 short-wave receivers / sound proj. and EXPO for 3 players / singers with 3 short-wave receivers / sound proj. sine-wave generators and ring modulators / sound proj. 1971 TRANS for orchestra and tape (cond.) / sound proj. 1972 YLEM for 19 players / singers / sound proj. for one or two dancer-mimes with orchestra or tape / sound proj. Musical Theatre for 4 players / sound proj. for 6 percussionists and music boxes / sound proj. mezzo soprano or alto or low tenor; baritone; bass. for clarinet, flute and piccolo, trumpet and piano / sound proj. and trumpet, soprano, bass clarinet, bass / sound proj. 1980 ARIES for trumpet and electronic music / sound proj. 1977 LIBRA for bass clarinet and electronic music / sound proj. and one with bass clarinet transposed. 1977 JUBILÄUM (JUBILEE) for orchestra (cond.) / sound proj. trumpet (music printed in three colours); trombone; tuba. Each of the following scores may be performed by itself, either staged or in a quasi concert version. and 8- or 2-track playback / sound proj. tapes with choir and instruments / sound proj. with trumpet and orchestra (cond.) / sound proj. choir and orchestra (cond.) / tapes / sound proj. for 5 trumpets (or 1 trumpet in 5-track recording / sound proj. dancer / tapes / sound proj. for alto flute, bass clarinet and tape / sound proj. 2 tapes / sound proj. The principal colour of THURSDAY – Michael's Day in the composition LIGHT – is blue. 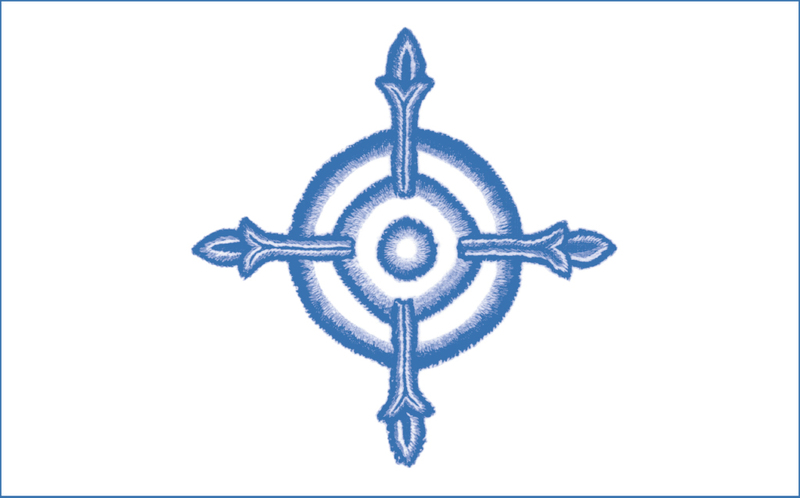 The Michael sign has 3 concentric blue circles on a white background superimposed with a blue Michael's cross. Each tip of the cross, outside the blue circles, is again cruciform, like the bud of a lily (or like a flame) between two open leaf tips. ad lib. : "jury" (soprano, bass, 2 dancer-mimes) / 2 tapes / sound proj. (EXAMINATION of THURSDAY from LIGHT as piano solo) / sound proj. (from MICHAEL'S JOURNEY) for trumpet and basset-horn / sound proj. 2 dancers (ad lib.) / 1 percussionist (ad lib.) / sound proj. for tenor, bass, elec. organ or synthesizer / sound proj. Hammond organ or synthesizer / tape / sound proj. or in a quasi concert version. (1st scene of SATURDAY from LIGHT) for bass and piano / sound proj. for flute and 6 percussionists or as flute solo / sound proj. symphonic band or symphony orchestra (cond.) / sound proj. for men's chorus, organ, 7 trombones (live or tape) (cond.) / sound proj. (LUCIFER' DREAM of SATURDAY from LIGHT) as piano solo / sound proj. (82 bound pages, 1 colour photograph, 2 black-and-white photographs, cover in colour). exact description of how the electronic music was produced. for percussionist and synthesizer player or as percussion solo / sound proj. 2 percussionists / sound proj. or as solo for piccolo trumpet / sound proj. 2 euphoniums or synthesizer / percussionist (ad lib.) / sound proj. Version for euphonium, percussionist, synthesizer player / sound proj. tenor horns (baritones), tubas / sound proj. (basset-horn live and tape, or tape only) / sound proj. modern orchestra (3 synthesizer players, 1 perc., tape) / sound proj. electronic keyboard instruments (tape) / sound proj. Version for basset-horn / sound proj. Version for alto flute or flute / sound proj. for bass, actor, a synthesizer player, tape, sound proj. Solo for flute with piccolo and alto flute / sound proj. 1987 for girls' choir (or women's choir) a cappella and piano / sound proj. as piano solo / sound proj. Duet for basset-horn and synthesizer player / sound proj. for basset-horn and alto flute / sound proj. Electronic and Concrete Music may be ordered. for a mel o dy in stru ment with mi cro tones / sound proj. 1989 YPSILON Version for basset-horn / sound proj. 1989 YPSILON Version for flute / sound proj. either staged or in a quasi concert version. for tenor, bass / modern orchestra (14 instr. ), tape / sound proj. choir (cond.) / 8-track tape (octophonic Electronic Music) / sound proj. Electronic Music of TUESDAY from LIGHT / sound proj. for modern orchestra, tape / sound proj. or for flugelhorn and electronic music / sound proj. electronic music with sound scenes (20-track tape) / sound proj. for soprano, bass / flute, basset-horn / electronic music / sound proj. for soprano, baritone / flute, basset-horn / electronic music / sound proj. elec tron ic music / sound pro j.
electronic music ad lib. / sound proj. (3 S, 3 A, 6 B) / electronic music / sound proj. Electronic Music for PIANO PIECE XVI may be ordered. Electronic Music for COMET may be ordered. for choir a cappella (with singing cond.) / sound proj. for orchestra, electronic music / sound proj. 2 dancers / sound proj. (4 bound pages, cover in colour) [5 x 22"
Electronic Music for 11 soli from ORCHESTRA FINALISTS may be ordered. for oboe and electronic music / sound proj. for violoncello and electronic music / sound proj. for clarinet and electronic music / sound proj. for bassoon and electronic music / sound proj. for violin and electronic music / sound proj. for tuba and electronic music / sound proj. for flute and electronic music / sound proj. for trombone and electronic music / sound proj. for viola and electronic music / sound proj. for trumpet and electronic music / sound proj. for double bass, a percussionist and electronic music / sound proj. for basset-horn, trumpet and trombone / sound proj. performance score in which the part for bass clarinet has been transposed. in which the parts for English horn and bass clarinet have been transposed. performance score in which the part for clarinet has been transposed. performance score in which the parts have been transposed. the performance score in which the part for basset-horn has been transposed. the performance score in which the part for horn has been transposed. Karlheinz Stockhausen: Kompositorische Grundlagen Neuer Musik. FREITAG aus LICHT / FRIDAY from LIGHT (Leipzig Opera 1996). MITTWOCH aus LICHT / WEDNESDAY from LIGHT (Birmingham Opera 2012). drawings of the sets and costumes, as well as explanatory texts about the works. of the new staging of THURSDAY from LIGHT in 1985 by the Royal Opera London. They include the entire libretto in German and English. (in Italian, Laterza & Figli, Bari, 1985). [translated by Bill Hopkins], Faber + Faber, London, 1973). INORI: cover of score "Vortrag über HU" ("Lecture on HU") with form scheme of INORI. nebula with photos of the four soloists. MONDEVA (MOON-EVE): four photos of a performance. DRACHENKAMPF (DRAGON FIGHT): photo of a performance and MICHAEL-sign. ARGUMENT: photo of a performance (Royal Opera, London) and MICHAEL-sign. FESTIVAL: colour drawing by Stockhausen "Schönheit bis zur Pracht..."
VISION: scene with the three soloists at La Scala, Milan. TRAUM-FORMEL (DREAM FORMULA): Suzanne Stephens in costume with basset-horn. ZUNGENSPITZENTANZ (TIP-OF-THE-TONGUE-DANCE): photo of a performance (La Scala ) and LUCIFER-sign. super formula segment for SATURDAY from LIGHT. EVAs SPIEGEL (EVE'S MIRROR): Suzanne Stephens with basset-horn and EVE-sign. SUSANI: Suzanne Stephens in costume with basset-horn and EVE-sign. SUSANIs ECHO: Kathinka Pasveer in costume with alto flute and EVE-sign. ENTFÜHRUNG (ABDUCTION): Kathinka Pasveer with piccolo flute and EVE-sign. Xi: Suzanne Stephens in costume with basset-horn and EVE-sign. Xi: Kathinka Pasveer in costume with flute and EVE-sign. FLAUTINA: Kathinka Pasveer in costume with flutes and EVE-sign. HOCH-ZEITEN (HIGH-TIMES): cover of the score of HOCH-ZEITEN for choir in gold with Sunday sign. MUSIK als GRAPHIK (MUSIC as GRAPHICS): poster for an exhibition of Stockhausen's drawings – with MICHAEL formula. 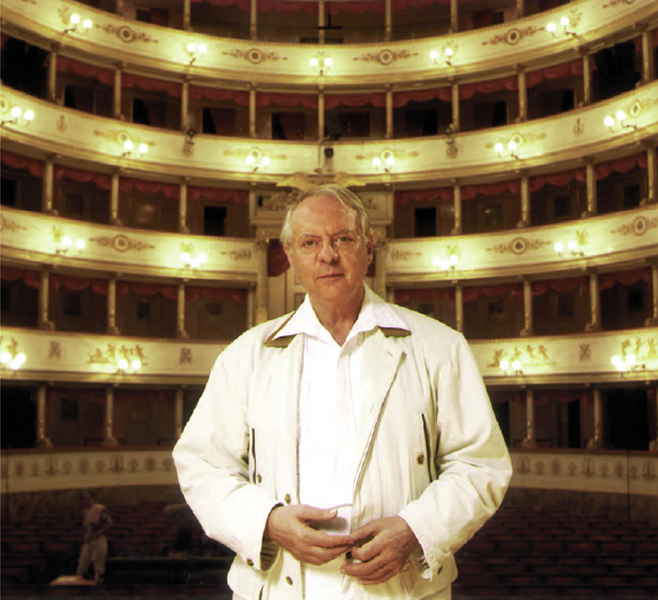 Colour photograph (60 x 40 cm) of Stockhausen. 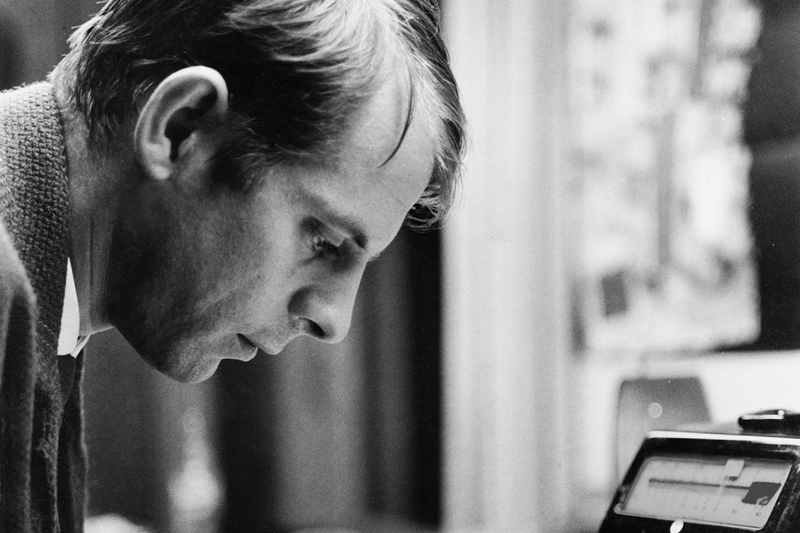 Black-and-white photograph (60 x 40 cm) of Stockhausen. Stockhausen in 1970 at the mixing console in the spherical auditorium in Osaka (in colour). HYMNEN with soloists in the caves of Jeita, Lebanon, on November 25th 1969 (black-and-white). Stockhausen conducts HYMNEN with orchestra (in colour, 1 m wide x 35 cm high). They are printed on glossy paper on one side only and are suitable for framing. 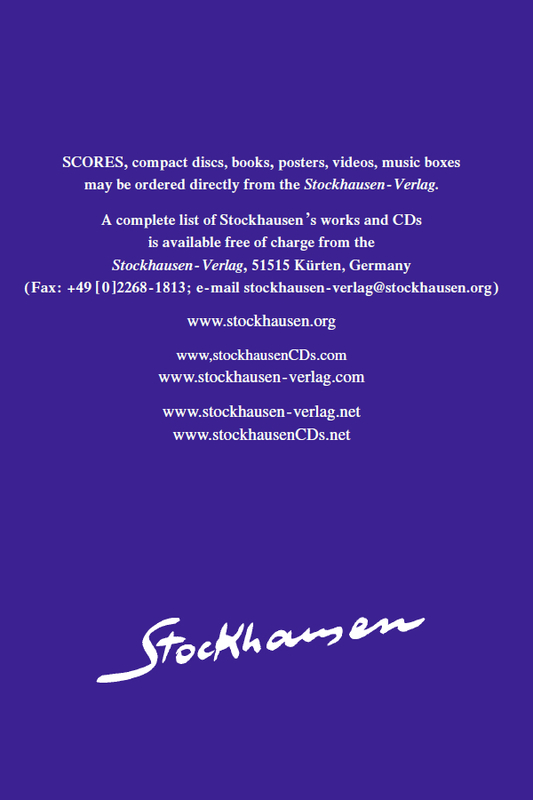 A list of historical posters of Stockhausen concerts is available upon request. Stockhausen-Verlag. For more information, please contact us. 1 to 40. 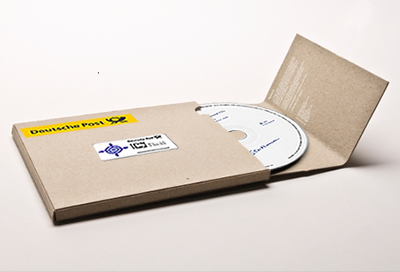 They may be ordered directly from the Stockhausen-Verlag. the composer - are silk-screened onto the lid of each music box.